Tacos for breakfast? You bet! Whether you have leftover chorizo from a previous meal, or you are just looking for a heartier way to jazz up your morning routine, we can't think of a better way to start your day than to take this classic Tex-Mex meal from dinner to fuel-powered breakfast. It's as simple as adding eggs! 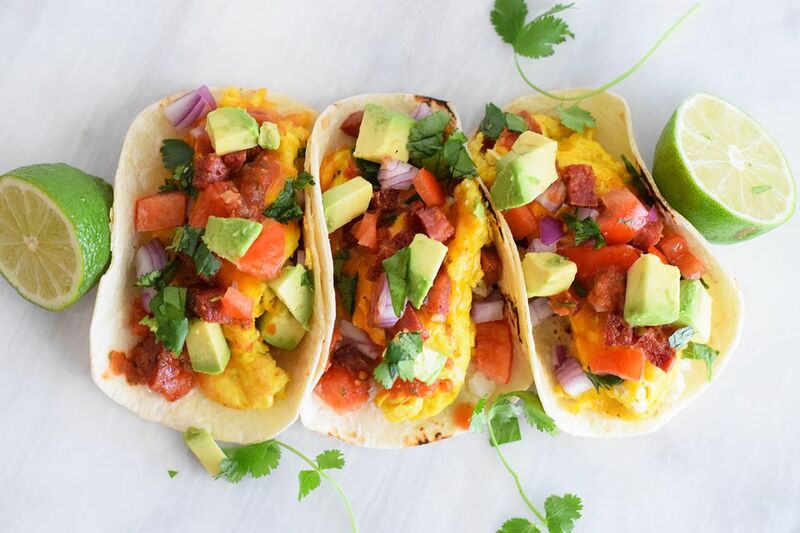 Perfect for a Cinco de Mayo celebration or a fun weekend brunch, you can transform the mundane breakfast of scrambled eggs with a few simple and basic ingredients, such as avocados, onions, tomatoes, and cheese. Have fun additions like tater tots, sour cream, beans, salsa, hot sauce, bacon, and chives, and get your kids engaged by creating a build-your-own-taco bar! If you're ovo-vegetarian, you can leave out the chorizo (and bacon). Warm up flour tortillas in the microwave or quickly over an open flame. If you want the char, place over an open flame for 5 to 7 seconds and then flip with metal tongs, and char for another 5 to 7 seconds. Heat a large non-stick skillet or cast iron pan on medium-high heat. Add the chorizo, breaking it up as it cooks. If the chorizo is dried, dice it first and then add it to the pan and sauté until some of the fat has rendered and the chorizo is crispy. Remove the chorizo from the pan, leaving the grease behind. Add the thawed tater tots to the chorizo grease and cook until slightly browned. Remove the tater tots from the pan and add them to the chorizo. Keep the chorizo and potato mixture warm in a 200 F oven while you cook the eggs. Using that same pan, turn down the heat to low. Pour in the beaten eggs and cook, stirring gently until completely cooked. Use a spatula to separate the eggs into four portions. While the eggs are still in the pan, turn the heat down even more and top each portion with cheese. Sprinkle the cheddar over the top of each egg portion and cover the pan with a lid. Allow to cook for 1 to 2 minutes or until the cheese has melted. Add salt and pepper to taste. Fill each tortilla with a portion of the eggs. Divide the potato and chorizo mixture between the four tortillas. Then sprinkle the cilantro, diced onions, tomatoes, and avocados over the top of each taco. Then drizzle the salsa over each taco and serve immediately!